NEW YORK (CNNMoney.com) -- For 12 years, Andrea Herrera played it safe and stayed out of debt. 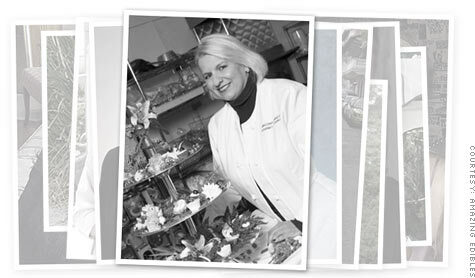 The Chicago catering business she opened in 1995, Amazing Edibles, grew slowly but steadily; 10 years after launching, the business had annual sales of $650,000 and the kind of debt-free balance sheet most business owners fantasize about. Herrera, who describes herself as "risk averse," was determined not to spend a single penny her company didn't have. She feared that if she couldn't repay a loan, she would lose her savings and business. 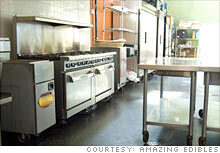 Amazing Edibles' new home finally has the professional kitchen the catering business needs. But that caution came with a price: Herrera's reluctance to expand was crimping her business. She rented a 1,000-square-foot storefront and relied on a six-burner range more fitting for someone's kitchen then a professional caterer. She had an executive chef, but Herrera did the marketing and sales herself to keep costs down. That's a common tactic for female entrepreneurs -- one that typically limits both their risks and their rewards. Of the 10 million female-owned businesses in the U.S. only 3% have annual revenue of more than $1 million, compared to 6% of all male-owned businesses, the Center for Women's Business Research reports. To boost her business, Herrera in 2006 joined the Accelerator program of the Entrepreneurs' Organization, a networking group for of business owners. Accelerator offers mentoring for businesses in the $250,000 to $750,000 range to help them advance to the seven-figure sales level. Participating in the program was like graduating with an MBA, she says. Encouraged by her mentor, John Fairclough -- the CEO of Resicom, a Chicago-area facility maintenance company -- Herrera boosted profit margins by culling through and slashing her expenses. Fairclough suggested that she hire a marketing manager, and helped her learn to manage a bigger staff by delegating responsibilities and crafting metrics for measuring her workers' performance objectively. But as her business savvy grew, her office space couldn't keep up. Herrera decided to bite the bullet: In 2007, she found a 5,000 square-foot commercial condo that would cost $395,000 to buy and $300,000 to renovate. Money Herrera didn't have. She had enough saved for a $75,000 down payment, and the condo sellers agreed to finance the balance of the mortgage themselves. But several banks rejected her application for a loan to fund the renovations. One said it considered catering businesses too risky; another wanted her to finance the renovation herself before it would consider a loan. Herrera decided to put her personal credit on the line. She borrowed $125,000 against her home equity, and pulled another $50,000 out of credit cards to fund the renovation work. Leslie Grossman, co-founder of Women's Leadership Exchange networking group, says she's seeing more female entrepreneurs step up and fight for the capital they need to grow their ventures. Women are becoming "less risk-adverse, funding their businesses better and going for outside funding at a faster rate," she says. Statistics compiled by the National Women's Business Council back that up: The dollars lent to women-owned businesses through the Small Business Administration's lending programs rose 9.3% from 2004 to 2008, compared to a 0.1% drop in overall SBA lending. Herrera's new space debuted in 2008. The light-filled brick loft includes a separate area for small weddings and dinner parties, a stove with 12 burners and two grills, a double-stacked convection oven, a walk-in cooler and freezer, and a tasting room. Amazing Edibles' staff has grown to eight full-timers, including an operations manager, new executive chef, sous chef and marketer -- plus seven part-time workers. Marketing manager Lisa Nuske has brought in steady new clients such as the University of Chicago and University of Illinois, and regained corporate customers whose catering budgets had been slashed. One of Chicago's marquee businesses, Oprah Winfrey's Harpo Productions, is now a client. Nuske also devises promotions and distributes e-mail blasts and newsletters. "She frees up my time so I can think about strategy and manage the staff," Herrera says. The capital investments are paying off. In 2009, Amazing Edibles crossed the $1 million mark in annual revenue for the first time, and it's on target for $1.3 million in 2010. American Chartered Bank, a local bank specializing in small businesses, recently agreed to consolidate Herrera's credit card, mortgage and construction loans into a 30-year, $400,000 loan. Amazing Edibles is still profitable, though its margins have taken a hit as the extra cash from higher sales gets redeployed into paying down the expansion costs. But Herrera is glad she finally took the risk. "Having a more beautiful facility has given me the courage to go after clients like Harpo," she says. "We're not a little storefront anymore. We can sit at the table with the big boys."